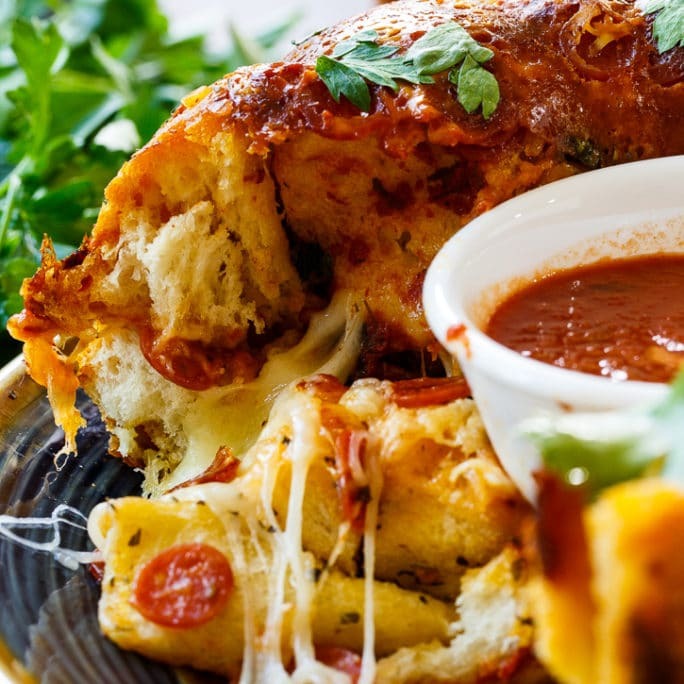 Pizza Monkey Bread has all the flavor of pizza in a fun, pull-apart bread form. 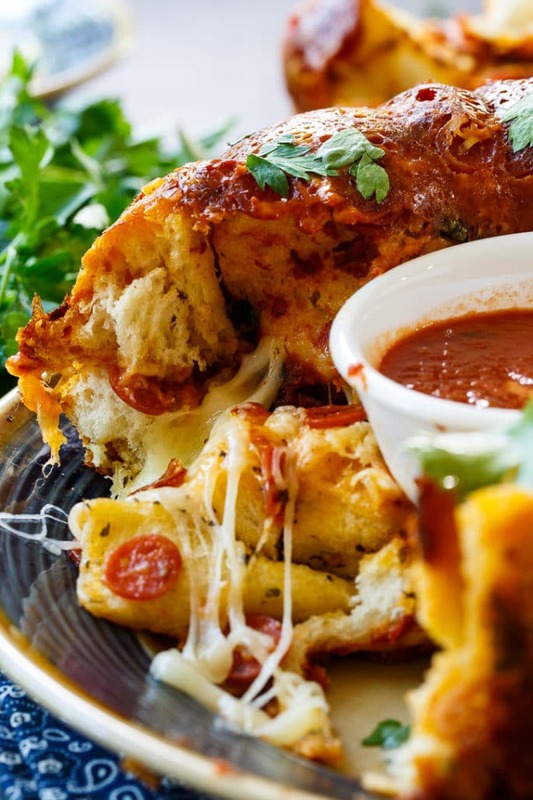 It’s layered with pizza sauce, lots of mini pepperoni slices, mozzarella cheese, and Parmesan cheese. 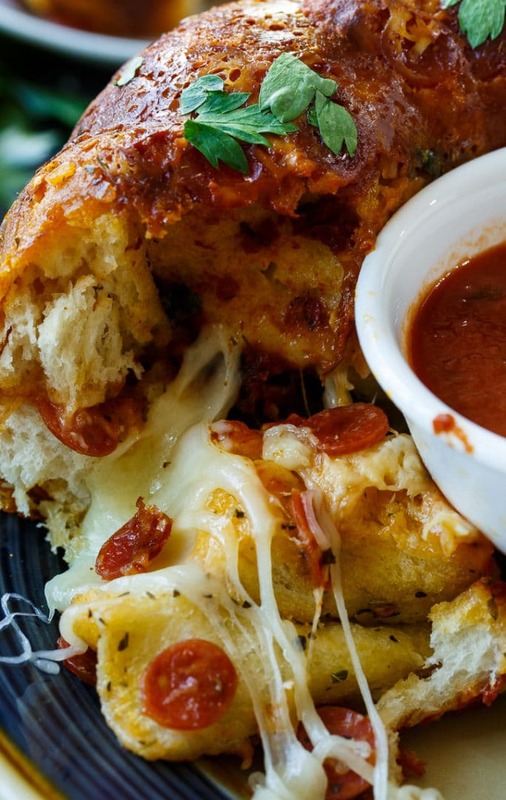 Dip the pieces in pizza sauce for even more flavor. You’ll need a Bundt pan for this recipe and you’ll want to spray it well with nonstick cooking spray. I don’t have one, but a cast iron Bundt pan would be perfect for getting a crispy crust. I’ve used a tube of refrigerated biscuit dough and a tube of refrigerated pizza crust. Mainly because I couldn’t decide which one to use. You could use 2 tubes of biscuits or 2 of pizza dough, but I like the way one of each tasted together. 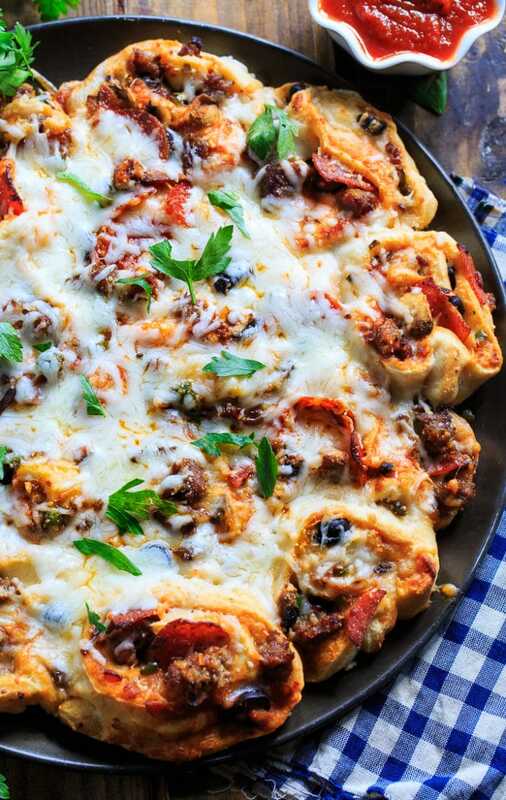 The biscuits are cut into quarters and the pizza dough into 1 1/2-inch pieces. Then they are coated in a mixture of olive oil, melted butter, garlic, red pepper flakes, dried onion flakes, and Italian seasoning for lots of added flavor. 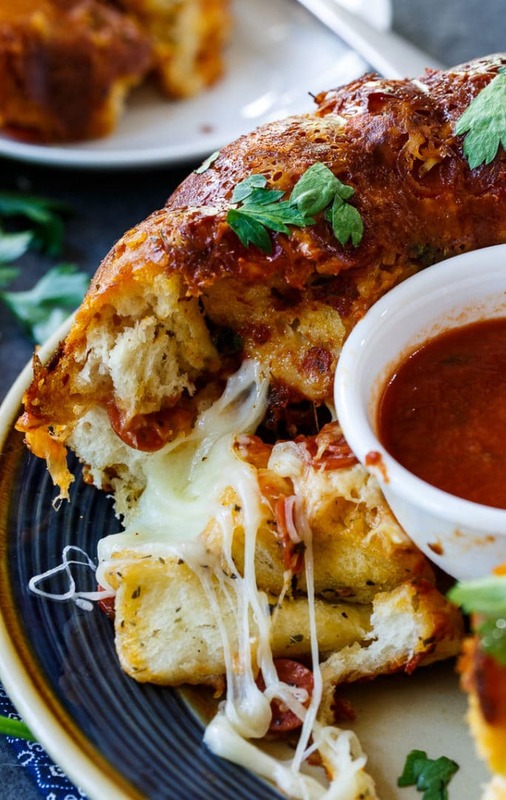 Once out of the oven, you want the Pizza Monkey Bread to cool it slightly in the pan, about 10 minutes, but not too long or it will start to stick. If you’ve greased the pan well and you run a knife around the edges before inverting the pan, you shouldn’t have any trouble getting it out in one piece. If you do, blame your pan. That’s what I do. In a medium microwave-safe bowl, combine olive oil, butter, onion flakes, garlic, Italian seasoning, red pepper flakes, and parsley. Microwave at 30 second intervals until butter is melted. Cut biscuits in quarters and pizza dough into 1 1/2-inch pieces. Scatter i/3 of pepperoni slices and 1/3 of Parmesan cheese in bottom of Bundt pan. 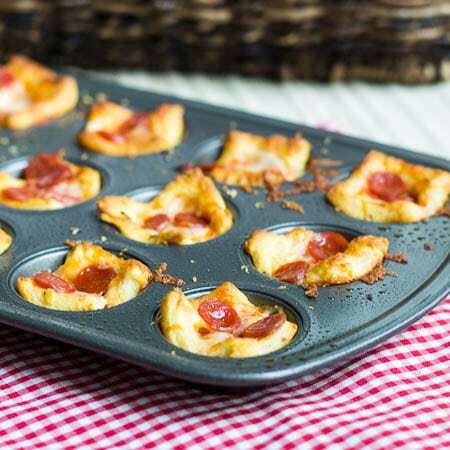 Toss biscuit and pizza dough pieces with olive oil mixture. Scatter half of biscuit/pizza dough pieces in Bundt pan. Scatter half remaining pepperoni pieces and Parmesan cheese on top of biscuit/pizza dough pieces. 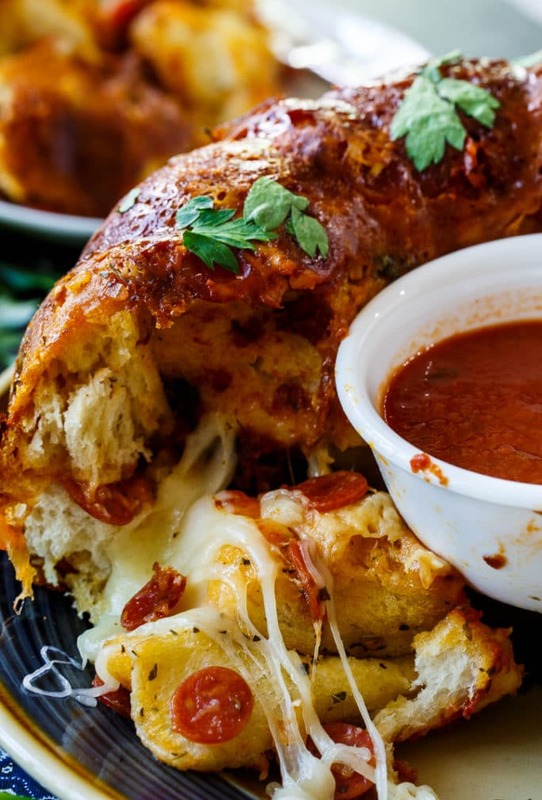 Pour 1/4 cup marinara sauce evenly into Bundt pan and then sprinkle half of mozzarella cheese into bundt pan. 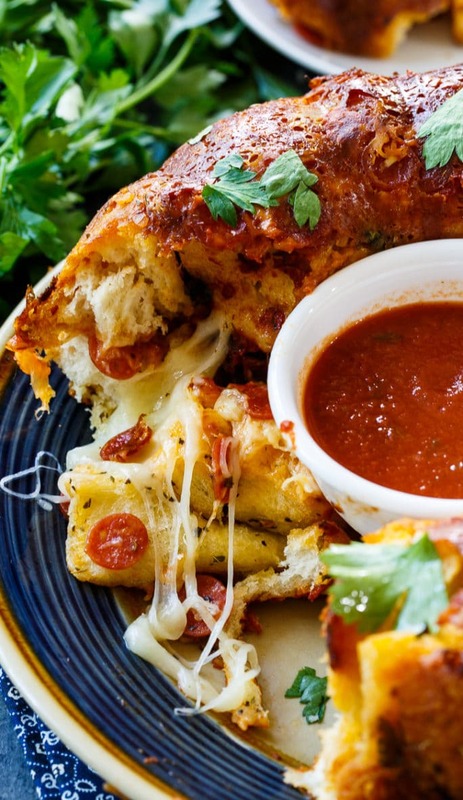 Add remaining biscuit/pizza dough pieces to Bundt pan and top with remaining marinara sauce, pepperoni slices, Parmesan cheese, and mozzarella cheese. Place in oven and bake for 40 minutes. Let cool 10 minutes and remove from pan. This entry was posted in Breads and Muffins and tagged Monkey Bread. Bookmark the permalink. Can you make this ahead of time? Say, a day or so? And if so, what’s the best way to keep it? It won’t be as goood if you make it a day or so in advance and you would need to store it in the refrigerator. I live in a country where I can’t get the refrigerated doughs. Can anyone recommend a dough from scratch recipe to modify this recipe? Unfortunately for me everything has to be made from scratch in my world. If making a savory monkey bread, I might cut the sugar in the dough down to 2 tablespoons. Seems like I never leave here without a growling stomach. This is such a good idea! Looks so tasty, and something everyone will love! great idea, thanks for sharing this, I can see a lot of pizza options here too! I’ve never made a savory monkey bread before. My boyfriend would absolutely love this! YUM!! This is my kind of monkey bread! Looks so good, Christin! I just love the pizza topping in here! 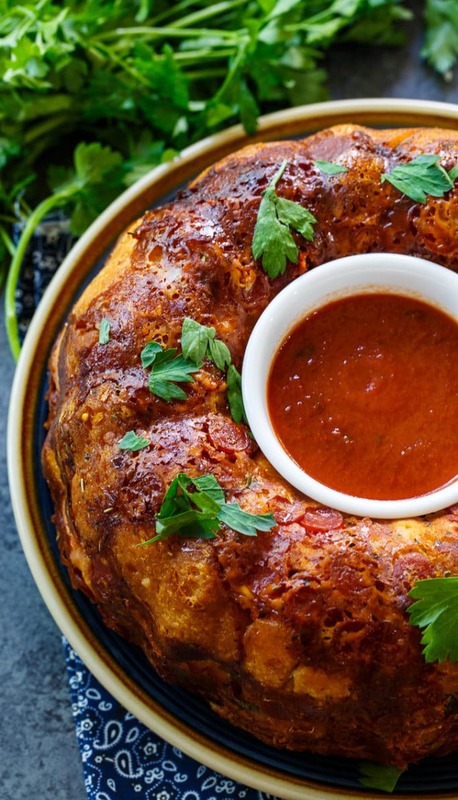 This savory spin on monkey bread looks incredible!